I’m delighted and happy to pay $6 for two scoops of ice cream at Jeni’s. Why? I believe the secret starts with the spoons. 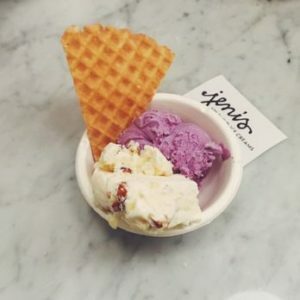 Jeni’s serves delicious, premium-quality ice cream. It’s expensive, yet whenever I go there, I never think about how much the ingredients cost as compared to the price I pay. 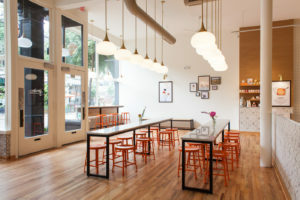 The reason, I believe, is that every aspect of Jeni’s is carefully crafted to create a premium experience and justify the price. Let’s start with the metal sample spoons. They’re metal! They feel premium because they are premium. In every other ice cream parlor I’ve ever been to, the sample spoons are plastic. 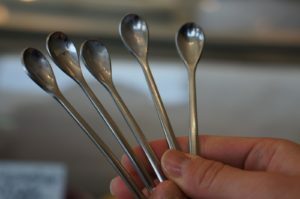 The result of the metal spoons–and the friendly staff–is that you feel like you’re getting special treatment. It’s a white-glove service for ice cream. The environment of Jeni’s supports the premium feel as well. Wooden floors, long, elegant tables, classy lighting, plenty of space, etc. When I get Jeni’s ice cream, I want to eat it there. Of course, it’s also important that the ice cream is delicious. If the final product isn’t aligned with the other layers of customer experience, all is for naught. What does this mean for Kickstarter creators? If you offer a premium option–and I encourage you to do so–think about the various ways that you can support the idea that it’s worth the premium price. Part of it is the composition of the product itself, like the giant ray guns and player mats in the deluxe version of Overworld Games’ Leaders of Euphoria. That’s comparable to Jeni’s ice cream tasting delicious. But what about the metal spoons and the environment? I think those are related to the atmosphere and personal service you offer through the Kickstarter campaign. Though I wouldn’t recommend being nicer to premium backers over other backers. It’s more about consistency–show all backers that you’re there to help and engage with them every day. You could also prioritize the shipping for premium customers. If you offer a premium product or service, look for your plastic spoon and figure out how to make it into a metal spoon. That is, look for the aspects of (or surrounding) the product that don’t support the premium claim. Maybe your product looks great but your website hasn’t been updated since 1995. Maybe the product packaging needs an upgrade (see how Top Shelf Gamer packages their products). And so on. Find your plastic spoon and upgrade it. What does this mean for tabletop game publishers? For me, Jeni’s demonstrates that if I’m going to charge a premium price ($70 or higher), I need to ensure that every aspect of the product and the experience is carefully crafted to support that price. Honestly, that’s what I already aim for, but sometimes I forget the back end of that decision: If we’re offering a premium product, it’s okay to increase the price to support the premium nature of it (and to ensure that it’s a sustainable product for Stonemaier). What do you think? Where have you experienced a carefully crafted premium product or service? This is a series that will feature innovative strategies from non-Kickstarter, non-tabletop game companies as they might apply to other businesses. If you have any recommendations, please send them to jamey@stonemaiergames.com. I pay premium prices for Japanese whisky and donuts. How much would metal coins increase the cost of a game? After the distributor and retailer increase it by their percentages. Would it be $5? Having them separate costs the consumer about $20 to $25 extra including shipping. Are you thinking of releasing a super premium game for $100 in 2018? I seen an Enigma Box on Kickstarter and the base price for that game was $200 but most people went for the $350 option. It depends on the coins and how the publisher wants to let them increase the price (it’s the publisher who determines the MSRP, not the retailers and distributors). There is one game I’m considering that has super premium components. If we make it, I’ll definitely think about Jeni’s when I look at every component, the box, and how we offer it to people. I meant the MSRP is created by knowing the markup % the distributor and retailer expect. So if extras cost $10 to manufacture, the MSRP will not just be $5 extra. It could add $8.5 to the MSRP. But having it separate for $20 is understandable, as it has it’s own box and separate shipping etc… But my point was that increasing the price will reduce the cost for customers, well competitionists. However, if a game reaches a $70 mark you might as well make it $100 with metal spoons and organic sprinkles. Once it is at the $70 mark it is in a different category and you might as well go all out. For example I would not pay $5 at Jeni’s with plastic spoons. I will just get the $4 ice cream with plastic spoons, because $5 is too expensive. But I would pay $6 with metal hobbit spoons. The $70 with a few perineum things could seem very expensive, but a $100 game with amazing components could be viewed as a great deal. The $100 game would need be great or have a special theme that appeals to adults. A $100 cartoon pirate game might not do well even with the best components known to humankind. That’s generally true. :) Though I think there’s a big difference (in the eyes of a consumer) between a $70 game and a $100 game. We were able to put metal coins in Charterstone at $70. Jamey: Definitely. I have never been able to justify dumping $100 into a base game upfront. I know many others are the same way. The $80 for Scythe was a big stretch for me (I don’t think I ever bought a game above $50 retail before that), but I was able to justify it because I really enjoyed the game, and the quality of components was fantastic. Had Scythe been $100 retail, I don’t think I could have gotten past that mental barrier, even if it had included metal coins, the board extension, and/or realistic resources in the box. So what I’m basically trying to say is that it’s okay to charge a premium price for a premium gaming experience, but there is a point where you’re going to start to price out a good chunk of your target audience. You might pay $6 for a premium ice cream experience, but that doesn’t necessarily mean that you’ll pay $10 for an even nicer experience. At some point you’ll start to question why you don’t just pay $2 for a soft serve cone that’s still pretty tasty. Yes, it would have to be more than coin or dice upgrades to make people think $100 is a great deal. It would need something unique, or feel very special, not just an upgrade. I was thinking of looking into toy manufacturers instead of board game manufacturers. Toy manufacturers seem to produce even more complex things than board game manufacturers. Some complex toy sets are very cheap. Board game manufacturers seem to get worried by stuff that was standard practice for toy companies back in the 1980’s, like stickers on cards. The creators of “Escape Room in a Box” were forced to go with a toy manufacturer. I wonder if toy manufacturers are the key to higher quality board games at lower costs. Did you ever get quotes from toy manufacturers? I think the single biggest way a KS creator can provide a Premium experience is with personal responses. Backers want to know their contribution is valued, not simply as a drop in a bucket, but as a personal choice to support. Notifications of posting, regular updates, public mentions of individual participation etc all add to the ‘premium’ surrounding a good product. Well said, Martin. It’s similar to the “white glove” service that Jeni’s offers to every customer. If a creator can do that for their backers, it’s definitely creates that premium feel. Awesome insight! I am fascinated by the ways companies make premium or even “premium” products. Now this really ties together if you present your product as premium (like with metal spoons. That doesnt change the flavor or ingredients of the ice cream, but makes you think that its special) then your product is premium, thats when the magic happens. Cody: I really like these examples about how the presentation of something makes a huge difference in a person’s perception of the product! I saw an interesting example of this dynamic in a previous job that I had where rural municipal economic development was part of my portfolio. We were in Central Alberta and there was a relatively remote rural Inn that was trying to entice Calgary oil executives to hold retreats and meetings at their site. After failing to attract that sort of business for several years in a row the owner/operator made one simple change: they increased their rates. Literally nothing else about their product changed but suddenly they were booking to capacity with oil business. The only thing that changed was the perceived value of their offering. Calgary oil companies are used to paying significantly higher rates than what the local rates were. The Inn was losing business by virtue of the fact that their rates were too reasonable to the point where it made companies question what sort of value they actually provided. Tyler: That’s really interesting! I’m glad you mentioned it, because my article focused on how to reinforce a premium price, and I failed to mention how the price itself has an impact on perception (and sales). Thanks! I am not a kickstarter game developer but I do appreciate levels of quality. The heft, clink, and metallic shininess of the metal coins in Scythe and Viticulture, for example, adds something to the gameplay IMO. In addition I feel like they complement the quality of the other components. I love Terraforming Mars. Fairly good quality everything (oh those shiny cubes!!!) except I, like others, feel like the thin player mats have something to be desired. I would gladly pay another $20 for thicker player mats ala Scythe with cutouts (good job on those btw). In my own small business (game related woodworking – Crokinole boards and such) I could opt for plastic cribbage pegs for the scoreboard markers but that does not translate into the kind of quality I attempt to achieve. The heft and shininess of metal pegs is just a small quality adjustment but I believe important in the eyes of my customers. ‘to ensure that it’s a sustainable product for Stonemaier’. Curious what this means to you. Sustainable comes across in so many ways: longer lasting components, a game that doesn’t wear out its welcome, financially viable product for Stonemaier, company has a policy of developing games with sustainable resources/environmentally friendly, etc. For me, most premium items I consume tend to be sustainable resouces/environmentally friendly and the price reflects that for the raw materials being costlier that the alternative. It’s a price I’m willing to pay for, but rarely see it as a selling point in this industry. Premium is generally used only to describe component upgrades. Would you agree? Also, I believe you’ve already proved your a premium, honest, and reputable company in so many ways, asking a higher price for a game you’re really committed to would only validate its worth. And if anyone questioned your integrity we’d all point them to your ‘customers aren’t cows’ segment. Chad: Thanks for your question. The “sustainable” point is about whether we make enough profit from a product to afford a second print run of that product. If that isn’t the case, it isn’t sustainable. Standards in board gaming have risen a lot over the last few years. The components in Twilight Imperium 4th Edition are far nicer and better designed than the ones in 3rd Edition. When 3rd Edition came out everyone was blown away by how awesome its components were. A premium experience today might be the standard experience tomorrow. Two games in recent times have really pushed the envelope in different ways. Kingdom Death: Monster and Gloomhaven. KD:M goes down the path of offering a ton of plastic and a huge number of purchasable expansions. Gloomhaven says “we’re going to give you a ton of stuff at tremendous value but everyone gets exactly the same game”. Personally I love the way that Gloomhaven went. The premium experience it gives isn’t even really the components. It’s the fact that you have hundreds of hours of gameplay packed into that giant box (which from experience can also fit a three year old). You feel good buying it because you feel like even though you’ve spent $110 USD (inc shipping) on it, you’re well and truly getting a bargain. KDM I think more appeals to people who love to paint and display their miniatures. For those people you get a heap of miniatures plus a unique and interesting game to use them in. The average spend for the nearly 20 000 backers was almost $650. These people were happy to throw hundreds of dollars at a game to get more and more stuff. I can’t say I’m a huge fan of this model. It seems excessive and feels excessive and if I had have spent $650 I’m sure I would have had buyer’s remorse. For a general board game I do appreciate when I get quality components, but I think more important than great components is great artwork. It certainly makes a game easier for me to sell to my wife if it has good art. Stephen: Definitely, I agree that perceived value (“how many times can I use/play this”) is a factor in what can make something feel premium. Though in general, I think a product’s status as “premium” is more than just value, as most games offer infinite replayability. Like, you can buy a copy of the novel The Fellowship of the Ring in paperback, hardback, or aged leather. All three give you the same value in terms of usability (each has the same words you can read as often as you’d like), but the premium version gets its premium status because of the components that elevate it over the other versions of the book. I think the key to any premium product is that the core product has to be worthwhile. A few years ago I was in the states with a friend and we went to the French Laundry restaurant. Our meals were $250 and we spent a further $250 on wine. It was, by a fair margin, the most expensive meal I’ve ever eaten. It was also the best value meal because the food that was offered was the best food I’ll likely ever taste. And I think that’s the key to a good premium product – the product (icecream in your example) has to be great before you add the trappings (silver spoons). Back to what I was trying to say – Gloomhaven and KDM are both premium products in the board game space due to their price points. Both give great value for different reasons. KDM gives you a solid game but the meat of what is on offer is not the game but the miniatures. If you’re into miniatures then KDM gives you fantastic value for money. Gloomhaven goes in the opposite direction. Its a great game which gives you tons of stuff so that you can prolong and extend the great game. Gloomhaven could have been a great game with half the components and half the scenarios. Possibly even a quarter of them. It could have been $50 with a quarter of the components and probably would have cracked the BGG top 100. But instead the game included loads more content, charged the cost of a premium product and gave people the feeling of incredible value, which is almost certainly why it’s now atop the rankings on BGG. Now in both of those cases there really was only one game (plus a ton of add-ons in KDM’s case). What is interesting is looking at the Tau Ceti kickstarter ( https://www.kickstarter.com/projects/outerlimitgames/tau-ceti-planetary-crisis-0 ). They released two copies of their game. A $49 base game and a $69 premium game. Of the 1300 backers that bought a copy of the game, over 1200 bought the premium version despite it costing 40% more. Despite never having played the game before, 12 out of every 13 backers were willing to spend more on the game to get all the bells and whistles. So in summary, provided the core experience is a good one, I definitely think that people are willing to pay a premium for a bigger, prettier and more tactile version of a game. Is there anything you haven’t written about yet :). The quality of plastic stopped me from buying Samurai. I seen a Rahdo review of it and thought it look like a 7 rating. But because I loved the hard (probably resin) artifact pieces so much, I decided 7 was good enough to buy it. The pieces look authentic. But when I went to buy it I found out that the new version had these cheap light plastic pieces in a modern re-design. They looked cheap and no longer special, so I canceled my purchase. I also seen a disappointed buyer review about that it. I also regret not spending $100 to get Rising Sun. But at that time, I had not broke the $70 barrier, financially or mentally. I think if you break the $70 mark and you see a game for $100 that has super special art and components, then the next step (from $70 to $100) is easy. If the art of Rising Sun was like MtG, the it is way too expensive. I would buy an 8-10 rating game with average art and components for up to $70. By average art I mean, seen it before MtG art. I would not buy an 8-10 game with average art and components for $100, so I am not buying Gloomheaven (average art in massive volume). I would not buy an average game that is fun with average art for more than $35. Tobago has monuments made out of actual stone. My son and I found that impressive. In Quadropolis the plastic insert has numbers embossed it that show the tile slot numbers for the rounds. I found that very nice and helpful. I seen a video review of some game, and the player mat had square dints for the placement of cubes. I was impressed by that. It would make it difficult for wooden cubes to get moved by a knock on the mat. Although the glass in Viticulture is very impressive and it does weigh more than cardboard tokens or wooden cubes. Hey Jamey, I’ve heard through the gossip mill that retailers generally do not like it when Kickstarters launch “premium” versions of games, because in their minds it devalues the “standard” version on offer in their stores. But that’s just grapevine-talk and there were no hard facts or examples given. I do know that my KS standard:deluxe ratio was about 1:4, while distribution was about 60:1 the other way. Ken: Thanks for sharing! I think I’ve only heard it from retailers who felt like their standard version was competing with a special version being sold elsewhere, which was pretty rare for our products (for each KS game, I only made enough extra premium games to cover shipping errors). One way to address that issue is to make one version of the game, and make it premium (like Charterstone). Another way is continue to sell the premium elements separately post-Kickstarter: That way retailers can offer the standard game at a reasonable price, and customers can add the premium stuff later if they want. Mmm, selling the premium elements separately is a good idea. I’ve seen Kickstarters package them separately too, and some even sent them in two separate shipments! I like the idea that you are giving us the option to choose our level of financial commitment. It took me 2 years to get finances (Christmas money) to get Scythe. I got the basic, what I call pauper’s version, which is still I feel a premium product, especially due to the art. It was about $55. Taking away the choice and having it all upgraded already would have been about $100 I think and would have taken me much longer/more sacrifice to acquire. I appreciate that you are keeping an eye on low end as well as high end. I desire the box and the add ons but I can still have the experience vs. no experience. I just cannot justify $100 price point, or find it very hard to. I did spring for Food Chain Magnate but had to sell some games to get it. On the other hand, I also do like the one and out for Charterstone, that we all well more or less get the same experience, I like that democracy and feel more included. (Did a trade in to acquire that). This is a hobby for rich people, and only through savvy collection management can I participate. That being said, I love Stonemaier and am willing to throw my limited resources at your products over other products due to that love of the company. Your products are prioritized because of your production. Euphoria blew me away – the box, the joy despite the challenging topic. You could have made it look dystopian but you made other choices which I love, but going off topic now. Candy: Thanks for sharing your experience with Scythe and other games. I’m flattered that you would choose to support my games–thank you for doing that. I try my best to keep our prices at a reasonable level, as I want to respect wallets of all shapes and sizes. Your note is a great reminder for me to keep doing that! I’m blown away by these custom plastic player trays.